The first teaser poster for The Dark Knight Rises was utterly brilliant. In addition to giving us the incredible image of a crumbling Gotham City, the designers were able to subtly place in the Batman symbol that made it instantly recognizable. Then the movie shocked us again with the theatrical poster, which presented all of us with the terrifying image of a broken bat cowl. Now the third poster has arrived, and, while I hate to say it, I am thoroughly unimpressed with it. Posted over on the film's Official Facebook page, the design is actually the exact same as the first, only the image has been moved to the top of the frame, some fake fire has been included, and Batman has been plopped in the middle. While it's not sloppy by any means, you do get the sense that the designers were running too close to deadline and needed to get something new out there. Check out the new poster below. Want to know what the good news is? As much as I don't like this poster, it isn't making me in any way less excited for The Dark Knight Rises. The trailers and footage that we've seen has all been mindblowing and makes us ache for when the film is released in July 20th. Just remember this: X-Men: First Class had some of the worst posters we've ever seen, but the movie itself turned out to be one of the best superhero movies of last year. 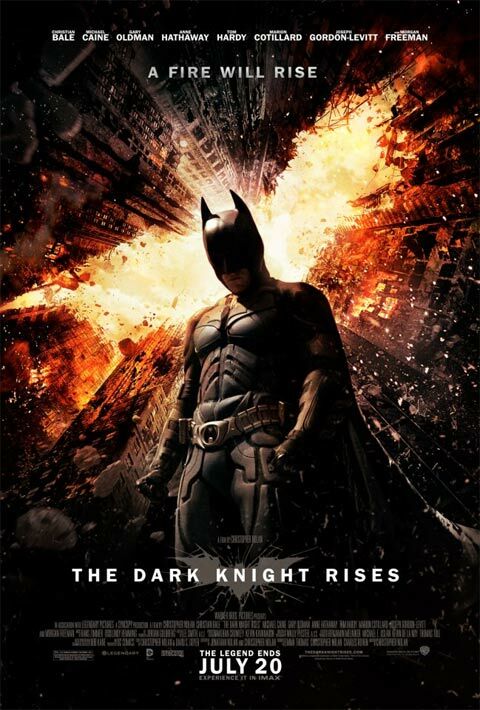 The finale of Christopher Nolan's Batman trilogy, The Dark Knight Rises brings back Christian Bale, Morgan Freeman, Gary Oldman, and Michael Caine, and will introduce us to Anne Hathaway as Catwoman, Tom Hardy as Bane, Marion Cotillard as Miranda Tate, and Joseph Gordon-Levitt as John Blake. The film arrives in theaters on July 20th and you can see more from the title in our Blend Film Database.